That was a joke. I am as effervescent as always. I love how I went from having birthdays at the end of face-melting summers in the tropics – where I was born – to late spring celebrations in the past 3-ish years (it’s closer to 4 years but I’m in denial). Right about now, past me would be waiting for the pre-monsoon showers, which always hit around this time of the year. Present me will get all of that rain. #PNW. Send it to my mama as a present for birthing me. So how does it feel to be almost 29?! A rollercoaster. This month I made some positive personal strides and other decisions that felt horrible in the moment. My sweeter than life husband has been a huge source of encouragement and I am grateful that he’s there to remind me that I’m not crazy. I’m still hoping he’s right and while it’s too soon to tell, I think I’ll be okay. I’m trying my best to be. Till then, we have drinks. 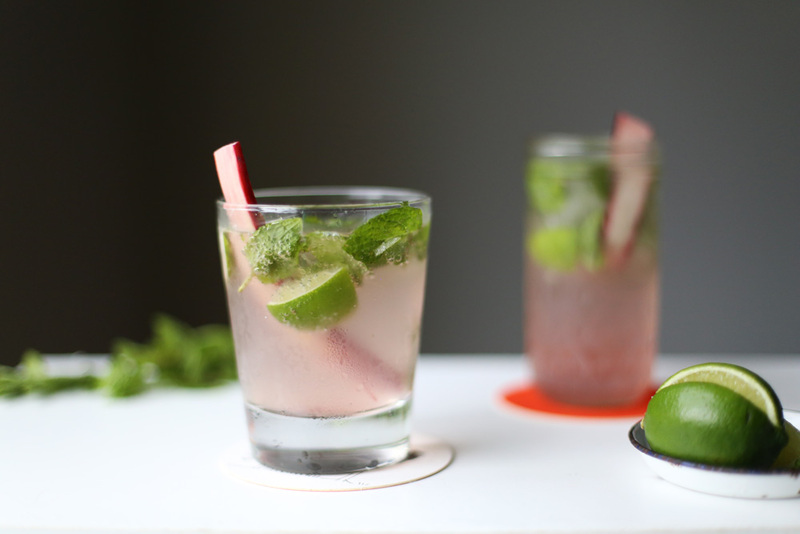 I’m sure you’ll find many recipes for rhubarb mojitos online but this one is special because I’m declaring it my birthday drink. 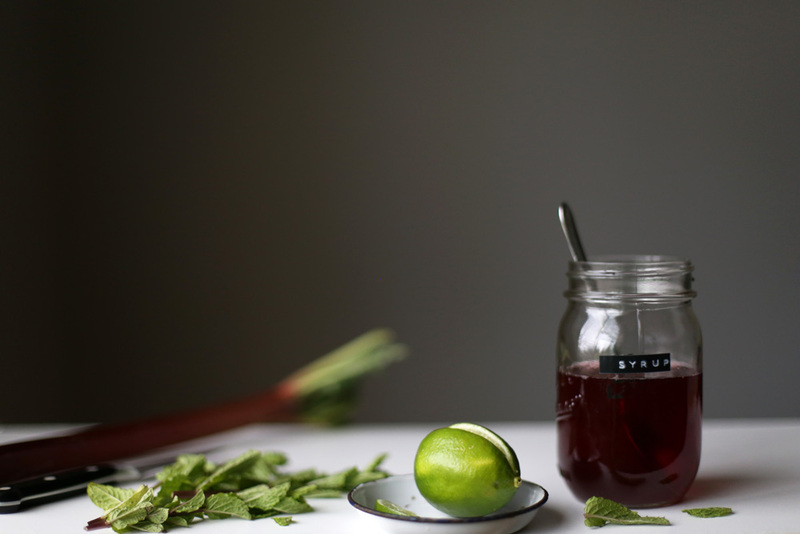 I was inspired to make it after drinking a strawberry mojito at Red Lobster last week and thinking “Damn this is so easy why am I not making this all day?” To sweeten the deal, I had a batch of rhubarb syrup sitting in my fridge. This drink basically made itself. 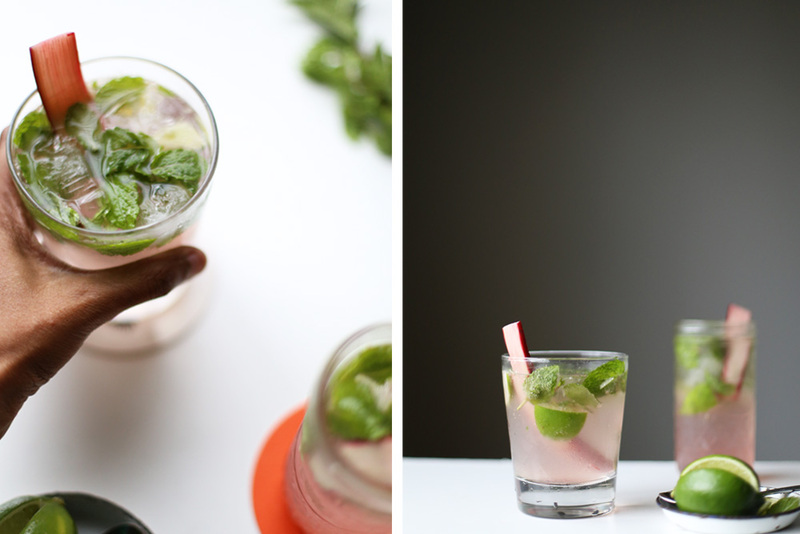 The mojito is said to have originated in Cuba. It grew in popularity because claims were made that it was Ernest Hemingway’s favourite drink when he lived in Havana. That myth was dispelled but this refreshing drink stands on its own without Hemingway’s help. 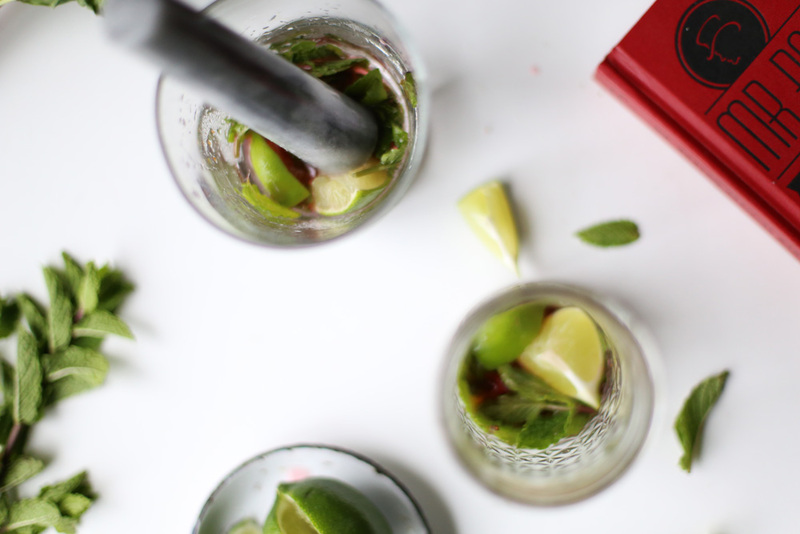 The recipe for a classic mojito calls for simple syrup. I subbed it with rhubarb syrup. If you want the drink less sugary, you could add a splash of bitters. If you want to make this a mocktail, leave out the rum and add ginger soda or a few more lime wedges to the soda that’s already going in the drink. Also good to know is that the recipe calls for the drink to be made in a Collins glass. According to the book Mr Boston Official Bartender’s Guide, a Collins glass is tall and long and typically holds 240-350 ml (8-12 fl oz). I used whatever glassware I had, which included a 12 oz Ball jar. If you use anything smaller, your drink might be stronger and vice-versa if you use a larger glass. Either way, please enjoy responsibly. I’m (almost) 29 and I get to say that. Add all the ingredients to a saucepan and bring to a boil on medium heat. Stir occassionaly in the beginning to help the sugar dissolve. Once it boils, take it off the stove and let it cool. 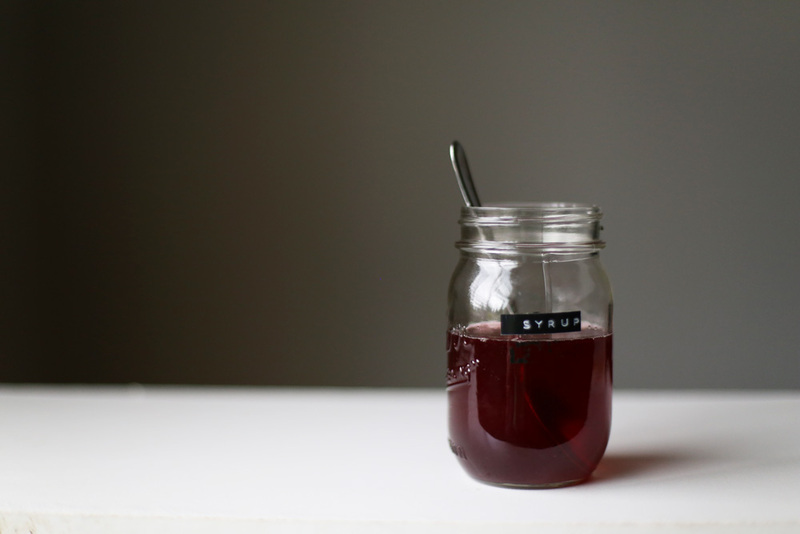 Strain the syrup through a fine mesh strainer and pour into a glass container. Store in the refrigerator for 1-2 months. Muddle the lime, mint and syrup in the bottom of a glass. Add the rum along with 2-3 cubes of ice. 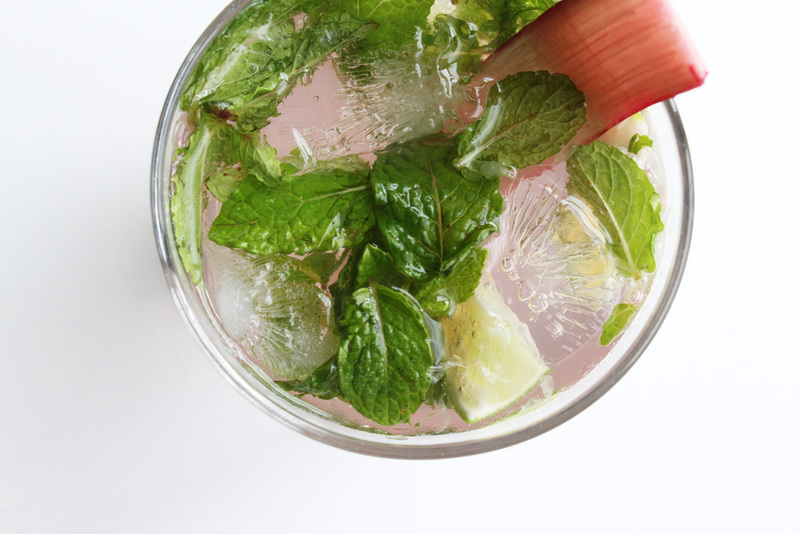 Top with soda water and garnish with more mint and rhubarb stalks. These are spectacular. 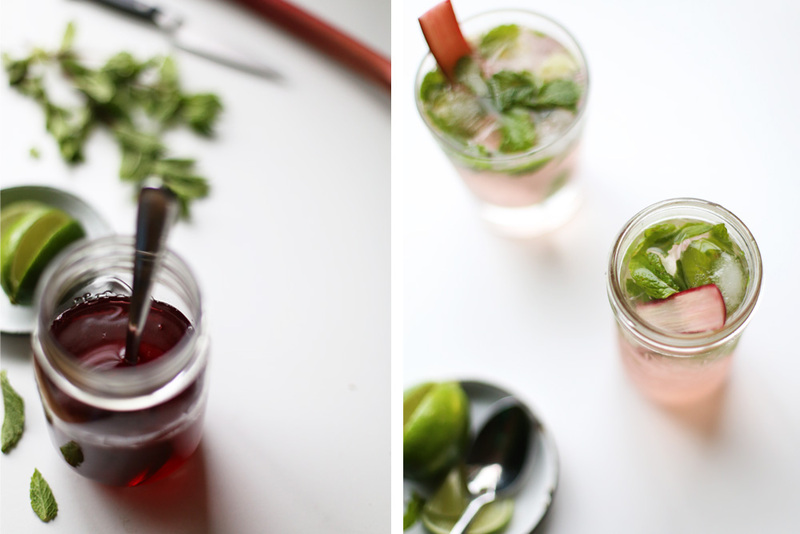 To the contrary, I’ve never seen a recipe for a rhubarb mojito, but now that you’ve done it, I can just imagine how rhubarb would go so well with mint in a fresh mojito — so perfect, Edlyn. HAPPY HAPPY birthday week!!!!!!!! Hoping things settle down soon, and hopefully with a lot of cake along the way. Thank you, Cynthia! I’m so glad for your good wishes. I don’t know any fruity flavour that mint does not pair well with so I knew I couldn’t go wrong with my Red Lobster inspired drink. Lol. Hugs to you!